VATICAN CITY (CNS) — Ecumenical relations, the memory of past suffering and prayers for a future of peace form the framework for Pope Francis’ itinerary when he visits Armenia June 24-26. 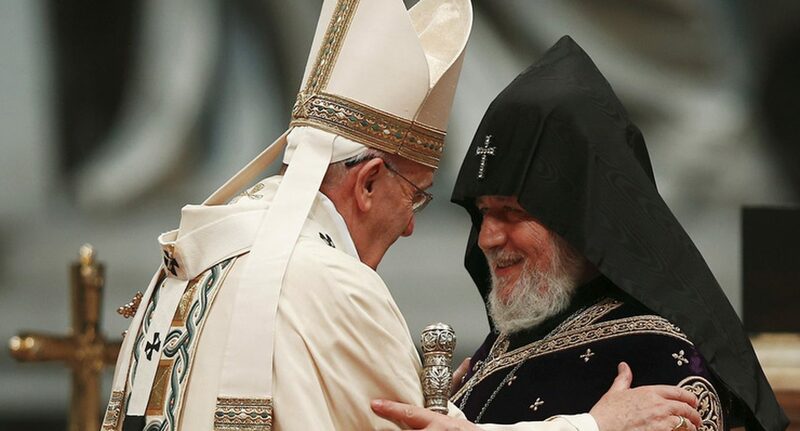 Following in the footsteps of St. John Paul II, who visited Armenia in 2001, Pope Francis will spend much of his time in the country as the guest of the majority Armenian Apostolic Church and will attend a divine liturgy celebrated by Catholicos Karekin II, the Orthodox patriarch, June 26. Pope Francis, like St. John Paul, also is scheduled to visit the Tsitsernagaberd Memorial, a monument to the estimated 1.5 million Armenians killed by Ottoman Turks in 1915-18. — 9 a.m. (3 a.m.) Departure from Rome’s Fiumicino airport. — 3 p.m. (7 a.m.) Arrival at Zvartnots International Airport in Yerevan. Welcoming ceremony. — 3:35 p.m. (7:35 a.m.) Visit and prayer at the Armenian Apostolic Cathedral in Etchmiadzin. Greetings by the catholicos and the pope. — 6 p.m. (10 a.m.) Courtesy visit to the president of Armenia in the presidential palace. — 6:30 p.m. (10:30 a.m.) Meeting with civil leaders and members of the diplomatic corps in the presidential palace. Speech by pope. — 7:30 p.m. (11:30 a.m.) Personal meeting with Catholicos Karekin II in the apostolic palace. — 8:45 a.m. (12:45 a.m.) Visit to the Tsitsernagaberd Memorial. — 10 a.m. (2 a.m.) Transfer by plane to Gyumri. — 11 a.m. (3 a.m.) Mass in Vartanants Square in Gyumri. Homily by pope. Greeting by the catholicos. — 4:45 p.m. (8:45 a.m.) Visit to the Armenian Apostolic Cathedral of the Seven Holy Wounds. — 5:15 p.m. (9:15 a.m.) Visit to the Armenian Catholic Cathedral of the Holy Martyrs. — 6 p.m. (10 a.m.) Transfer by plane to Yerevan. — 7 p.m. (11 a.m.) Ecumenical meeting and prayer for peace in Republic Square in Yerevan. Speech by catholicos and speech by pope. — 9:15 a.m. (1:15 a.m.) Meeting with the Armenian Catholic bishops in the apostolic palace at Etchmiadzin. — 10 a.m. (2 a.m.) Participation at the divine liturgy in the Armenian Apostolic Cathedral. Homily by catholicos. Greeting by pope. After the liturgy, the pope, catholicos and Catholic and Orthodox bishops will have lunch together at the apostolic palace. — 3:50 p.m. (7:50 a.m.) Meeting with delegates and benefactors of the Armenian Apostolic Church. — 4:05 p.m. (8:05 a.m.) Signing of a joint declaration. — 5 p.m. (9 a.m.) Prayer at the Khor Virap monastery. — 6:15 p.m. (10:15 a.m.) Farewell ceremony at the airport. — 6:30 p.m. (10:30 a.m.) Departure for Rome. — 8:40 p.m. (2:40 p.m.) Arrival at Rome’s Ciampino airport.